Sheri Karan of York describes herself as a “do-it-yourself” kind of person. For years, she has not only made her own bread, but also used a flour mill to grind grain into flour for that bread. She likes to grind things. She’s been making her own nut butters for years because she loves peanut butter and other nut butters so much. It turned out her do-it-yourself spirit has come in handy. Sheri had been a daycare provider for 15 years, running a daycare out of her home. She raised “hundreds of kids over the years.” Then, in 2012, her husband Troy was diagnosed with Stargardt’s Disease, which has damaged his retinas and caused blind spots in one eye and substantial vision loss in the other eye. Sheri and Troy’s worlds changed. They had to adjust to a “new normal,” she says. Soon, Troy had to stop working. Though she didn’t anticipate the trend, Sheri identifies with the fitness buyers and uses her own experience and her husband’s as a guide–she and Troy are runners and bikers and rely on nut proteins. Sheri used to be vegan, then vegetarian, and is slowly working other proteins into her diet. From her experience as a vegan, she appreciates that nut butters are not heavily manufactured vegan-friendly food. In their nut butters, you’d find nothing different than you’d find in nature. They even have a Nut’n but Nuts flavor that uses raw nuts. Sheri and Troy’s nut butters are not what you would find in a supermarket. They are thicker, and this natural nut butter doesn’t cook down and melt like traditional store-bought peanut butter. That’s because Blind Spot Nutbutters don’t add all the oils and stabilizers that large manufacturers would. 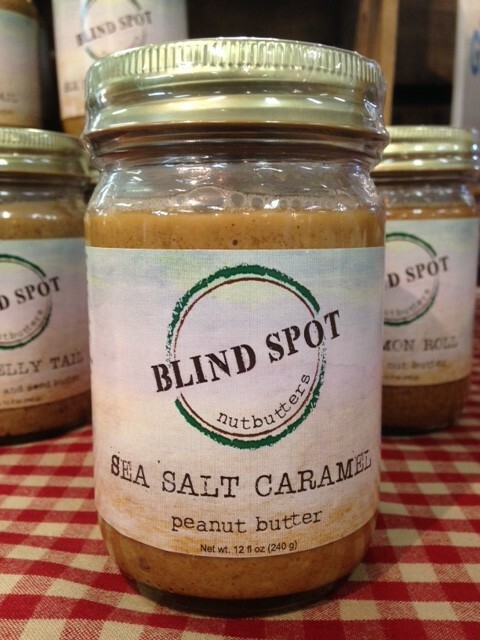 When Blind Spot Nutbutters are produced, they are simply ground down. Some of the nut is still intact. Even thinking “chunky peanut butter” doesn’t do them justice. A chunky peanut butter would grind all of the nuts and then just add peanuts back in. Theirs is all ground, but not ground to a pulp. You can taste each nut, she says. In addition to tasting amazing, nut butters are associated with incredible health benefits. Weight lifters order Blind Spot Nutbutters because they are not just a protein source but a CLEAN protein source. There are 6-8 grams of protein per serving, and while that’s not as much protein as you’d find in supermarket nut butter that has soy and other additives to boost the protein content, it is pure, clean protein. Nuts are rich in Omega 3’s and a good source of healthy fat. There’s a place for nuts in every diet. She and Troy do a lot of cooking with nuts (you can even find their recipes on Sheri’s blog). Because of this, they’ve crafted some flavors to be ideal for cookies and brownies. Not only are the nut combinations Sheri’s own creation, the spice blends often are as well. If a ready-made spice blend does not meet her criteria, she just makes it herself. Sheri wants to make sure she’s thinking outside the box with flavors and trying new things. Soon they’ll be releasing a brand new product: mustard. Since mustard is technically a seed butter, it isn’t too many steps removed from a nut butter. Right now, Sheri and Troy are aging it to make sure it tastes the way it should. After developing each flavor, there’s a process of tasting and testing that needs to happen to ensure each product is shelf stable. Sheri is looking forward to replicating a grilled cheese and tomato sandwich she once had at a New England restaurant. She’s keen to do it herself, even when it comes to making her own mustard for a sandwich. But Sheri’s “do-it-yourself” approach and “can-do” attitude don’t mean that she is relying only on herself to direct and further her life or her business. When she speaks of adjusting to the “new normal” and launching this business, she speaks of trusting God and believing that there is a plan. She wants to keep moving forward, as God directs her. If that forward momentum doesn’t end up leading anywhere, then there’s a new good thing. “It is a good journey,” she says. She admits feeling frustrated and scared when they started the business, but now they sell hundreds of cases of Blind Spot Nutbutters every month. Now she wants to avoid expanding the business too much. She wants to keep it simple and “stay true to the product.” “I’m very protective of my nut butters,” she says. It’s also important for them to self distribute. They want relationships with the retailers who sell their product. They want to talk about what’s working and what’s not. Sheri and Troy are excited to build a relationship with Weaver’s Orchard, and they’re looking forward to Taste of Weaver’s, where they’ll find a new set of customers to talk to. Sheri knows that there’s a group of customers near Reading who would get together and place a big order together to get free shipping. These customers would ask, “When are you going to sell the nut butters in Reading?” When Blind Spot Nutbutters were available on the shelves at Weaver’s, she emailed these customers to let them know they should head to Morgantown! At Taste of Weaver’s, she’s looking fowrard to meeting these customers. She’s also excited to share the nut butters with all of the Weaver’s customers who come to the event. She’s so excited, in fact, that she’s decided to bring all of their current flavors! 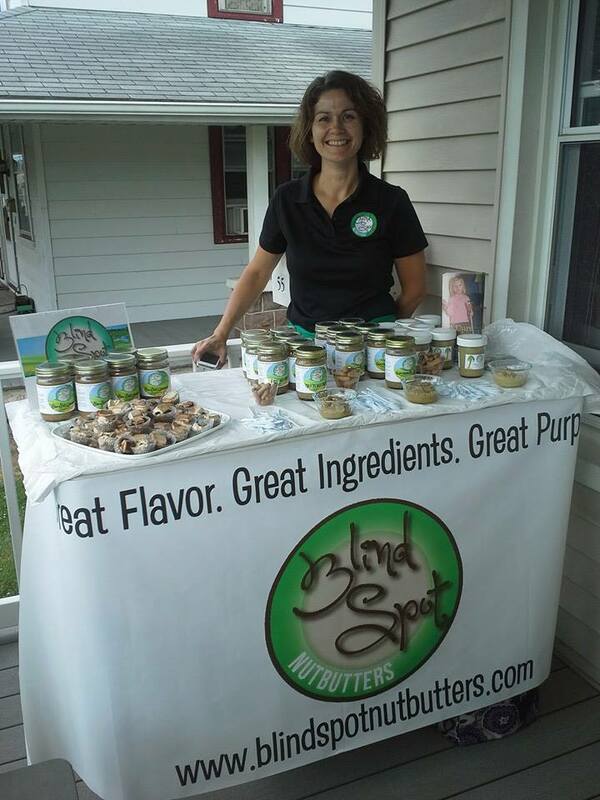 Stop by the Blind Spot Nutbutters booth at Taste of Weaver’s on June 4, 2016 from 10 a.m. – 3 p.m. Sheri and Troy Karan will join many local vendors and family businesses and farms at this free sampling event!